Timberbits - Helping you create with wood. We sell woodworking tools and machinery for the DYI Woodworker and Woodturner. We are the premium dealer for Vicmarc Machinery, Hamlet and Robert Sorby. We continue to add new brands to our range, our latest addions being Festool, Metabo, WoodRiver, INCRA Precision Tools, Magswitch and Tormek - these are just to name a few! Our passion is to help you create with wood! We are determined to offer the best service and best prices. We're located in South West Sydney in Villawood. Visit our contact us page for details. I am David Lim. I started the company in 2008 because I was sick of the poor service and range in Australia. What started as a hobby is now a full time passion. I am often away from the office, out fishing, doing deliveries and pick-ups or in the workshop (the place I love the most) and therefore it may be difficult to reach me by phone. I too am a pen turner and a fine furniture maker. I have converted this hobby into a passion. 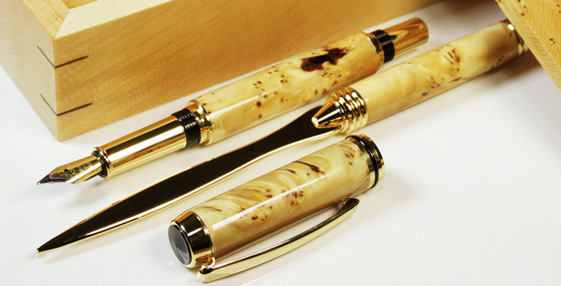 I currently make pens and timber items for woodworking galleries, jewellers and special corporate orders. I have turned thousands of pens and continue to do so. This business started accidentally. As a pen maker, I was sick of the lack of choice we had available to pen turners in Australia. I started importing pen kits, first from the USA for myself, but as the volume increased, directly from China and Taiwan. This issue we faced in Australia has been slowly changing. We now have, through healthy competition between pen kit sellers, a larger variety of pen kits available in Australia. Being a maker for the galleries and tourist centres, I designed and had the factories manufactured the Australiana series kits. We are still the sole importers of Australiana series Executive Sierras, Streamlines and Elegant Beauties. As a serious pen maker, I understand the importance of quality, longevity of hand made pieces and hard wearing - long lasting platings. We are proud to offer kits made in Taiwan plated in Gold Titanium, Rhodium and Platinum - the best plating you can get in pen kits. All the pens featured on this website, I have made. I also understand the other side of pen making. The person who does it for fun, the beginners who like to work with a budget, the retiree who has to live within his means but loves making pens. I make hundreds of slimline for fund raising events and inexpensive gifts. Price is important - get the best bang for your buck. I am not a pen kit seller who thumbs their nose at cheap made in China kits. I believe they too have a place in the market place. As you can probably sense, I am passionate about pen turning. I hope some of this passion rubs off on you and you create wonderful hand made pens that you can share with the world.